Due to intense training regimens, strict diets, and modern life in general, bodybuilders and other athletes are at risk of racking up too much physical stress. When this happens, they can limit their ability to recover from training, severely limiting their performance and results. Plenty of nutrients play their part in keeping this from happening—some you know, some you probably don't. One of the surprising big hitters in combatting oxidative damage is the mineral selenium. Selenium is a trace mineral that is part of many proteins in the body. A "trace" mineral is any mineral the body needs in amounts of less than 100 milligrams per day. Selenium exists in the body mostly in the form of selenoproteins. Selenoproteins are selenium-containing proteins which provide the basis for a variety of health and performance effects, such as muscle regeneration, cell maintenance, and—of course—transportation and storage of selenium. Oxidative stress happens when the production of free radicals outpaces the body's natural antioxidant defenses. Exposure to pollutants, toxins, and radiation, as well as too much life stress, lack of sleep, and having too much alcohol, tobacco, or refined sugars, can all lead to oxidative stress. Strenuous exercise is also known to produce reactive oxygen species (free radicals), which can contribute to oxidative stress. Antioxidant supplementation is meant to reduce oxidative stress, promote recovery, and enhance performance. Certain forms of selenium act in isolation—and some in conjunction with vitamin E—as antioxidants, combatting free radical damage to cells. The antioxidant needs of specific athletes, such as CrossFit athletes and bodybuilders, have not been fully determined, so although supplementation with trace minerals such as selenium may help reduce oxidative stress, more research is needed. Selenium forms a part of glutathione, an antioxidant enzyme that may provide protective effects against oxidative stress and cell damage. Supplementation with selenium may buffer some of the oxidative stress of strenuous exercise, resulting in less cell damage and quicker repair and recovery. It is important to note, however, that few studies have been done to demonstrate this. Can Selenium Raise Your Testosterone Levels? Selenium is also regularly called a "natural booster" of testosterone levels. Unfortunately, most research shows this claim may be exaggerated. A study published in The Journal of Urology looked at the effects of selenium supplementation on testosterone levels in infertile males. Participants took 200 micrograms of selenium per day for 26 weeks and saw their testosterone increase by ~2 nmol/L. This increase is very small, so it will have very little effect on performance or response to exercise. Another study found no effects on resting testosterone levels after four weeks of selenium supplementation in male cyclists. The bottom line is this: The effects of selenium intake on testosterone are extremely small and ultimately less significant than initially thought. Athletes are highly unlikely to see any performance benefits from increased testosterone with selenium supplementation. 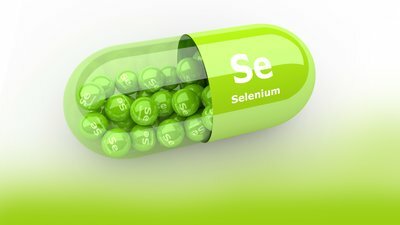 What Happens If You Don't Get Enough Selenium? Selenium is found in many foods, so deficiency is rare in industrialized countries. Documented cases of selenium deficiency in the United States and other western countries are almost unheard of. Cases of selenium deficiency have been documented in some places, particularly in areas of China with selenium-poor soil. These patients had a severe, often fatal form of cardiomyopathy called Keshan disease—named after the county in China in which it was discovered. Fatigue is a symptom associated with selenium deficiency, but by no means does being tired mean you're lacking in this mineral! Given the fact that very small amounts of selenium—we're talking micrograms—are required for normal function, don't start supplementing without first consulting your doctor. If you are consuming a normal diet with enough variety, and perhaps taking a high-quality multivitamin, you're likely hitting your daily selenium target and supplementation isn't necessary. The upper limit of healthy selenium intake is 400 micrograms. Side effects of too much selenium include brittle hair and nails. However, you would have to consistently consume way more than the upper limit over a long period of time before any signs of toxicity start to show. What Are the Possible Interactions With Other Supplements? There are no known interactions. It's thought to be OK to combine selenium with other supplements. Many multivitamins contain the RDA for selenium. Many of the foods we eat contain trace nutrients and minerals—including selenium—that work with the body to fight free radicals. Brazil nuts are rich in selenium, with a single nut providing about 95 micrograms. With the upper limit of selenium set at 400 micrograms, you could meet that with a handful of nuts. Selenium is also found in other foods, especially seafood. For example, a 3-ounce serving of oysters contains about 60 micrograms of selenium. Pork loin, oats, and brown rice are also good sources. A diet rich in these foods will help you hit your RDA for selenium. What Are the Available Forms of Selenium Supplements? Selenium is available in gels and capsules, but most people don't need more than they get from food. Check with your doctor before starting selenium supplementation. Chen, J. S. (2012). An original discovery: selenium deficiency and Keshan disease (an endemic heart disease). Asia Pacific Journal of Clinical Nutrition, 21(3), 320-326.